I’m happy to continue working with schools and organizations who are accomplishing great things for urban children and young people in East St. Louis, Illinois. 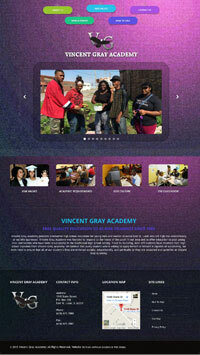 My newest website is for Vincent Gray Academy, a small high school in East St. Louis that provides alternative education for young people who have been unsuccessful in the traditional high school setting. Staff at Vincent Gray Academy works hard to ensure that all of their students receive their high school diplomas and have a plan to succeed after graduation. We selected this colorful template with unique “gift” navigation links to reflect the hope that Vincent Gray instills in their students and how each student is a gift full of promise waiting to be opened.